Our son loves the ladies. I know this because he flirts with them virtually everywhere we go and they fall for his long lashes and olive skin readily. He gets crayons and cookies from the ladies at the grocery, and baby doughnuts from the bakery. I think these ladies are generous and kind hearted to all the little ones but I think he works it. And good for him. Most of our friends have little girls so we joke about his multiple options. The Daddies of all these little girls assert otherwise as they assure us their daughters won't be dating boys until college. haha. Famous statement made by (incorrect) Daddies all over the map. But I believe our son has his first crush. and Gabbana's ad campaign with Scarlett Johansson. Now, let me give you the scene. I subscribe to about oh, ten, magazines. ( I presume to one day have excess free time to lounge in bath and casually read said magazines.) My point is there are many to choose from ranging from Time to Bon Appetite. In addition, he also has a stack of his own age-appropriate books on the same bench. So there are ample selections to view. 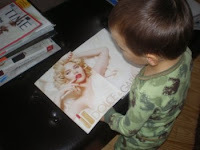 Vogue is one of the many but apparently, the only one of my magazines to capture our son's attention. Those of you with any exposure to two year olds realizes attention is a priceless commodity at this age. Let me go on. 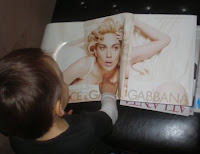 One day, our son opens the magazine and sees the picture of Scarlett Johansson. I told him as we do anytime he asks "Who is that?" (And by the way, that questions comes no less than ten times per day.) He actually gazed at the picture so long I was able to grab my digiCam and snap a photo. I thought how cute he was and this photo would be added to the stockpile of photos he will later be amused, or embarrassed by when I proffer them to his future paramours. 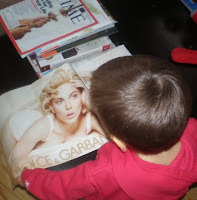 And then, I noticed he was gravitating toward same magazine fairly often. Once, I put it on the kitchen table curious if he would notice. Soon enough he asked me "Where did Scarlett Johannson go?" Now, I am touched by his curiosity and how carefully he turns the page to find his blond muse. And this activity has occurred frequently enough for me to capture several photos. Please note in each of these photos, he is actually wearing something different so he is spending a good bit of free time on this recent discovery. And yesterday, he marched right over saying "I find Scarlett Johannson" and once he found her, he actually kissed her picture. He kisses us often and all of his favorite bears but this was actually a first. I had crushes too, but I can't say they began as young as two. And from a mom's perspective, good for him. We will see how long this first crush lasts.